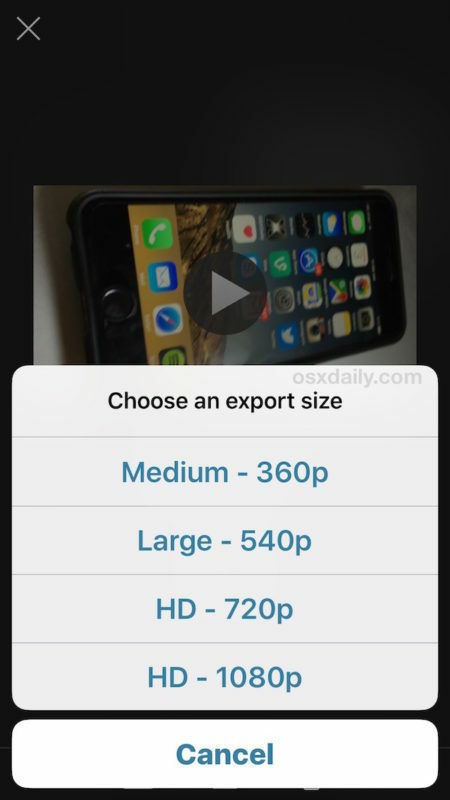 Many people record video on the iPhone or iPad and have the device oriented vertically, and while there is nothing inherently wrong with that, a side effect is you end up capturing vertical videos with large black bars on the sides. Fortunately there’s an easy way to rotate movies in iOS with little effort, which means you can fix a vertically aligned video by converting it to horizontal, go the other direction by rotating a horizontal video to vertical format, or even flip a video upside down. To rotate the video we’re going to use the iMovie app in iOS, which comes free on new iPhone and iPad devices. If you have an older device, you can download iMovie from the App Store. 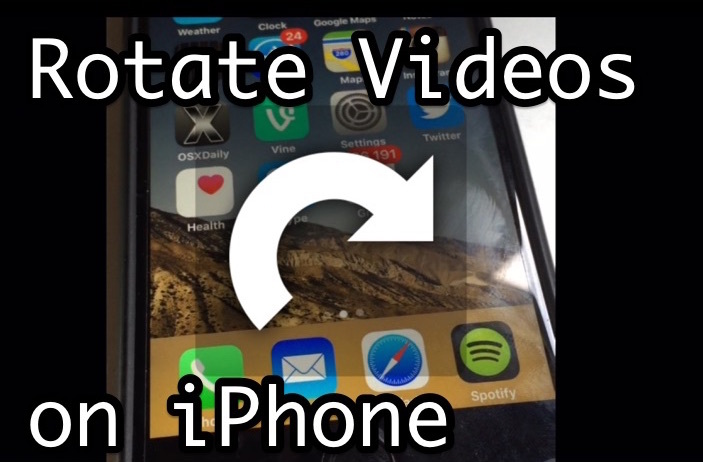 And yes this works to rotate any video type, whether the movie is 4K, slow motion, regular speed, time-lapse, and whether it’s your own video or someone elses on your device. 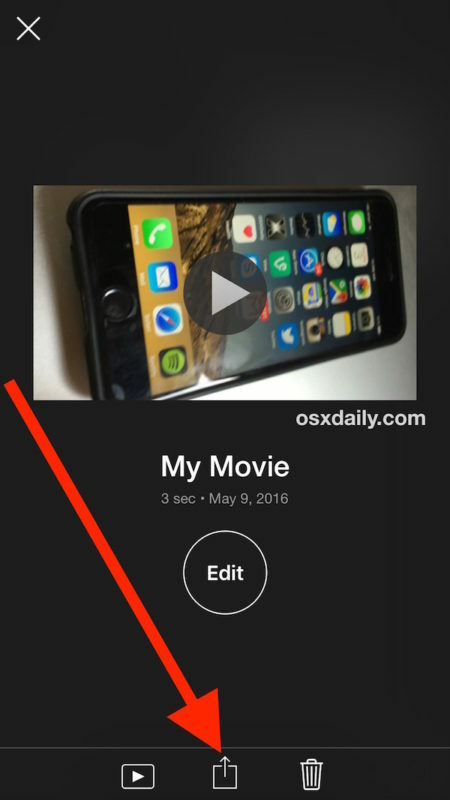 That’s all there is to it, your video has now been rotated and saved as a separate movie file onto your iPhone, iPad, or iPod touch. 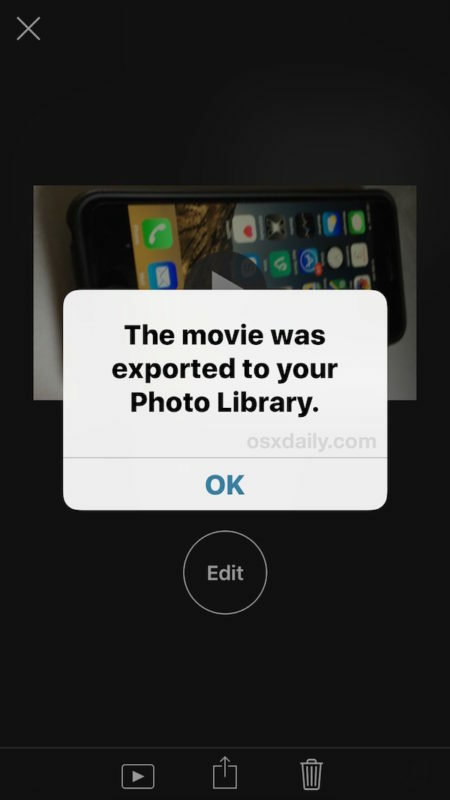 And yes, your iPhone and iPad videos are stored in the Photos app, not in the Videos app. This leads to a lot of confusion for newcomers to the iOS platform, but given that both are typically recorded with your own camera, it makes some degree of sense. 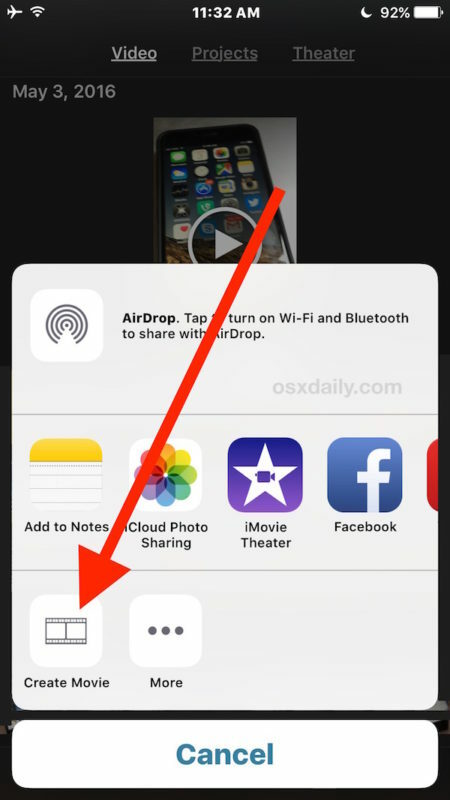 You can make it easier to locate your videos within the photos app by using the Videos album to display movies only in iOS, otherwise just launch the Photos app and you will find the movie you just saved. By the way, we also covered how to rotate videos on the Mac using QuickTime, which offers a super simple desktop based solution to reorientate videos if you’re in Mac OS X or have copied the videos to your computer. Similar offerings are available on Windows too. If you find yourself rotating videos constantly, a great recording tip is to just reorient the camera yourself and turn the iPhone or iPad sideways when recording video, that way you won’t end up with the vertical video to begin with. I’m sorry, but this tip is stupid/bogus. The video is NOT rendered to a different orientation, which is what most people want. It is just physically rotated. A video shot vertical and viewed rotated will is not usable? Are we supposed to turn our head 90 degrees to see it properly? iMovie and other tools, at least on the Mac, can truly rotate the video and re-render, but that means the image has to be cropped or zoomed up to fit the frame and the result is usually not what anybody wants. Ridiculous that this is so hard to do for a company that is supposed to be about making technology simple for the everyday man. Jobs had a good eye for catching things like this and fixing some of the ease of use items before the product got out of the gate. It’s something Apple misses since his passing. Seems like nobody is filling that QA role well. Why not take it the ‘right’ way round in the first place? How many monitors and TVs are set up in portrait orientation? That’s right, only advertising ones. Videos that are shot vertically frankly just look stupid. Agree on the vertical video. You can see how silly it looks if the video happens to make it onto the news. I’ve had at least one instance of a video shot landscape yet the video is rotated by the phone. That’s what caused me to research how to correct it, as neither Photos nor Lightroom offers an obvious way to do it. I agree with this, the vertical video issue is basically a software problem that Apple hasn’t addressed. There is little reason to have vertical videos, and little need to rotate them, the camera should be smart enough to adjust it automatically. The hardware has the resolution, the software needs to fit. Technology for the sake of it? Not sure what PB is saying, but I don’t think it’s a matter of catering to “too dumb”. It is a fact that holding the phone vertically is more natural (since this is the way you hold it almost ALL the time..), and even for people who understand about VVS, sometimes mistakes are made. If the device has a mode which prevents this mistake, it is a clear feature. It makes it easier to use properly. Another minor advantage of this mode is that you can use vertical orientation to give narrower field of view. Or even provide auto-horizon leveling. There is actually an app out that does all this (“Horizon”), but it suffers from degraded image quality when filming in vertical orientation. This is because it does not crop at the sensor, but at the video frame level. Since Apple would have complete access to sensor data, they could provide something similar in standard “Camara” app with fewer compromises. Thanks for the tutorial. Worked great on a video my wife took. There is a simpler way if you have iOS 10 installed. Go to Photos, choose clip you’d like to rotate, tap Edit (icon with sliders), then in edit mode tap three dots icon for extensions, choose iMovie extension, then rotate video using two finger method. Go back, Done and Done. I was just looking for a rotate button in the extension. Glad you pointed this out. I would love to know how you found it. This trip was perfect for someone who has no idea. I followed the steps, rotated my video, and exported it back to my photos. I can’t thank you enough. Best advice I found on the web. This didn’t work for me. It would not rotate. But the tip that Rade Martinovic left above, worked like a charm. Rade’s method above should be the preferred method described in the article. It’s easier, it replaces the original file, and it preserves the time stamp of the video so it stays in the right collection. What happens to me often is I’m moving fast and whip the phone up (in landscape orientation) while pressing the record button. Or I’m shooting straight down. Anyway, I have shot it in landscape but the inertia sensor lagged and flagged it for portrait video. So I’ve shot it right but it plays back wrong. 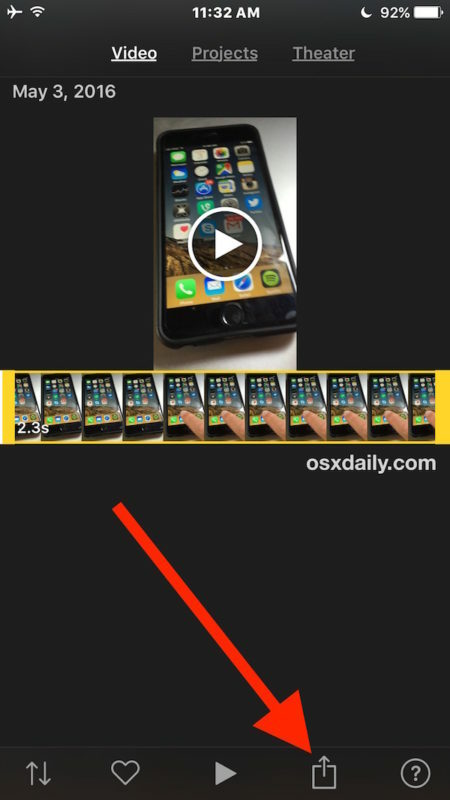 I’m with NoVerticalVideos, There should be a toggle to lock the phone in horizontal capture regardless of orientation. I used an app call Rotate and Flip which was perfect except that it renders crap choppy video. Something wrong with their codec. 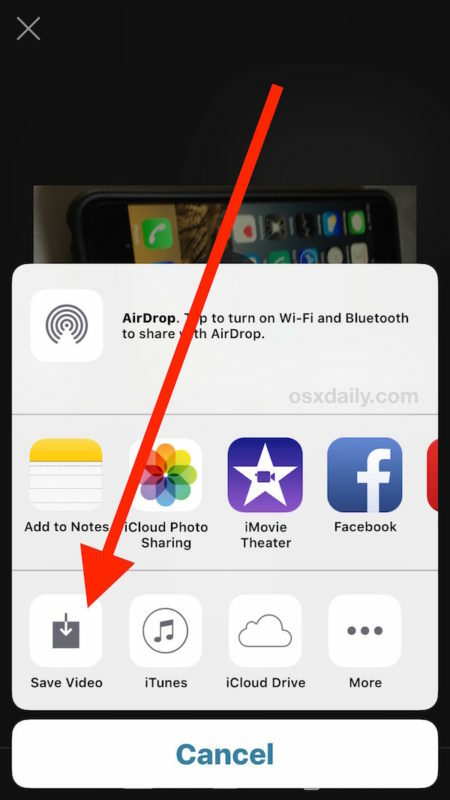 This share to imovie tip works 100% better! Please help. Having carefully followed the recommendations on rotating a video received on my iPhone 7 Plus by using IMovie, the top of the head and bottom of the video are clipped off. What can I do? It should not be so difficult to simply rotate a video. Was easy and very helpful. Thank you. A serious thanks , step by step approach with images helped made my work easy. You don’t have to open iMovie. 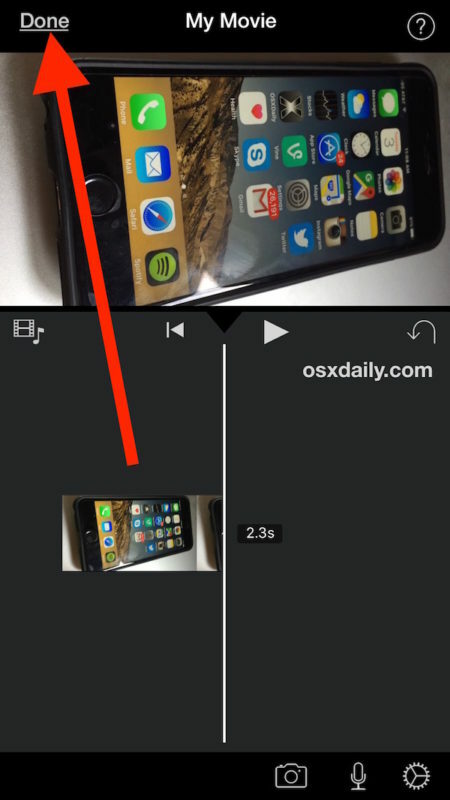 When viewing your video in Photos, go to Edit, the (…) button, and you’ll see iMovie appear as a plugin – open that, then rotate the video with two fingers, then hit Done, and it’ll save. 1) Sync automatically to Google Photo. Turn it there. Problem solved. 2) Buy a Samsung. Problem solved. In both cases Google is involved. 😭thank you!! I was lost about how to do this and had a video of my daughter that I would of been heart broken over if I never was able to fix it, so thanks to you! 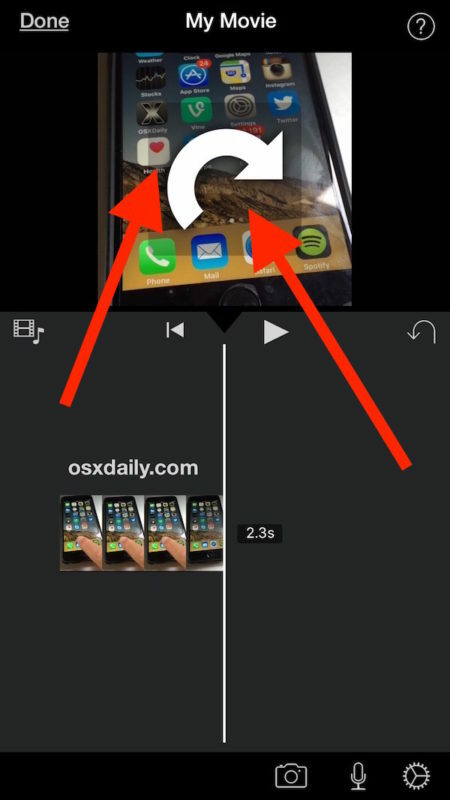 You can rotate a video on an iPhone/iPad a lot quicker using the Video Tools app. You can also zoom in, reverse, flip, or change a video’s speed. Right from within the Photos app with the Photos editing extension.